Located on Avenue L between Nostrand Avenue and East 29th Street, this playground, along with adjacent Junior High School 240, is named for the colonial Dutch settler and government servant Andries Hudde (1608-1663). Little is known of Hudde’s life before he arrived in America, save that he was born in 1608 in the town of Kampen, the Netherlands. In 1629, he traveled to the New Netherlands settlement and three years later was appointed Commissary of Stores, which meant that he was in charge of all supplies for the colony. In 1636, in partnership with several other Dutch settlers, Hudde purchased 3,600 acres on Long Island from Native Americans. That area today encompasses not only the site of this playground and much of the surrounding neighborhood of Midwood, but also the neighborhood of Flatlands and parts of Coney Island. Two years later, Hudde acquired more land, this time in lower Manhattan. In 1639, while on a visit to Amsterdam, Hudde married Geertruyt Bornstra (d. 1655). Returning to the New Netherlands that same year, he settled in New Amsterdam. Unfortunately, he soon found himself in severe financial trouble. His land purchases had vastly overextended his credit, and Hudde had to re-enter government service, this time as Surveyor of Manhattan. In 1644, he was appointed the Commissary for the South (now Delaware) River, and was stationed at Fort Nassau, opposite present-day Philadelphia. For nearly seven years, with minimal supplies and support from the Dutch authorities in either the Netherlands or the New Netherlands, Hudde attempted to establish a Dutch-Indian trade along the Delaware. His efforts apparently met with little success. In 1651, Hudde was transferred to Fort Casimir, near present-day Newcastle, Delaware. There he developed a good relationship with a trading rival of the Dutch, the Swedes. Hudde’s connections with the Swedes led to suspicion about his loyalties, and he was called back to New Amsterdam after one year to answer to charges that he had deserted Dutch rule. Although he was acquitted of all charges, he was left without a job. From 1652 to 1655, Hudde tried to make his fortune in Manhattan. He obtained a license to teach school, but there is no evidence that he ever actually taught. Hudde’s first wife died in 1655, and he soon remarried. With his second wife, he raised at least one child. Little is know of this second wife, and of the child or children they raised. Worsening financial problems forced Hudde to mortgage his property in Long Island. Fortunately, Hudde’s financial misfortunes coincided with the abandonment of several Swedish settlements along the Delaware River. The Dutch took possession of these settlements and appointed Hudde secretary and schout-fiscal, or sheriff, for the vice director of the new Dutch colony, which they called New Amstel. At New Amstel, Hudde excelled and served at various times, often simultaneously, as the colony’s chief clerk, sheriff, surveyor, and magistrate. In 1657, Hudde even briefly served as the colony’s director-general until the new director arrived from the Netherlands. While these offices brought considerable responsibility to Hudde, they did not bring him an equally considerable income. Living on the edge of poverty, he decided to leave the New Amstel colony and establish a brewery in Maryland. He resigned from all of his positions, and embarked on a journey to Maryland with his family. Before reaching Maryland, however, Hudde died from an “ardent fever” somewhere along the Delaware River in 1663. In 1947, Parks acquired this property. 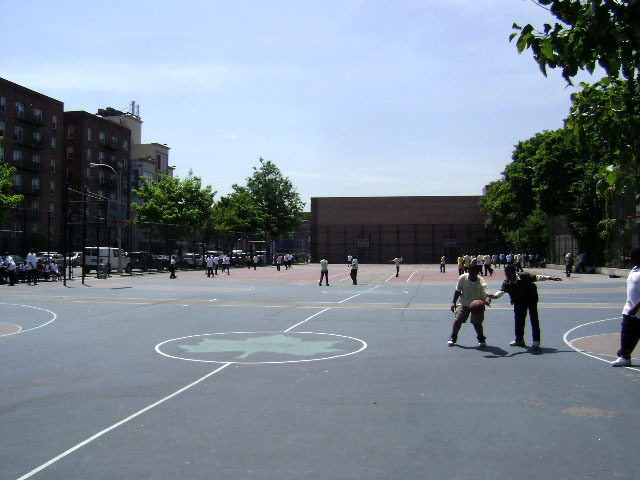 Sixteen years later, with the construction of JHS 240, the playground became a jointly operated playground administered by both Parks and the Board of Education. That same year, the park was designated Hudde Playground. 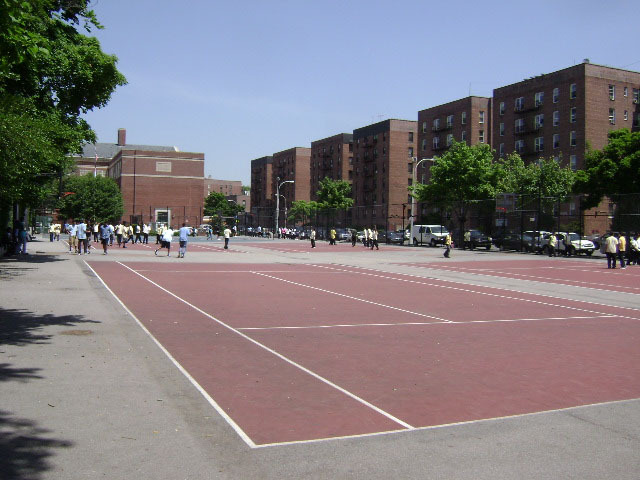 In 1998, Commissioner Stern renamed the park Andries Playground. One year later, a $658,000 capital contract renovation of the playground was completed, funded by City Council Member Lloyd Henry. The playground now has new paving, three full basketball courts, and two basketball standards. Andries Playground serves both as a memorial to a dedicated government servant and as a place of rest and recreation for people of all ages. Hudde’s connections with the Swedes led to suspicion about his loyalties, and he was called back to New Amsterdam after one year to answer to charges that he had deserted Dutch rule. Although he was acquitted of all charges, he was left without a job. From 1652 to 1655, Hudde tried to make his fortune in Manhattan. He obtained a license to teach school, but there is no evidence that he ever actually taught. Hudde’s first wife died in 1655, and he soon remarried. With his second wife, he raised at least one child. Little is know of this second wife, and of the child or children they raised. Worsening financial problems forced Hudde to mortgage his property in Long Island. Fortunately, Hudde’s financial misfortunes coincided with the abandonment of several Swedish settlements along the Delaware River. The Dutch took possession of these settlements and appointed Hudde secretary and schout-fiscal, or sheriff, for the vice director of the new Dutch colony, which they called New Amstel. At New Amstel, Hudde excelled and served at various times, often simultaneously, as the colony’s chief clerk, sheriff, surveyor, and magistrate. In 1657, Hudde even briefly served as the colony’s director general until the new director arrived from the Netherlands.